Providing on-site building engineering maintenance that exceeds client’s expectations and technology needs from start to finish. Our trained team will provide the highest level of service and value in the industry. Providing temporary building engineering solutions on a short-term basis through qualified, trained and well-managed engineers and maintenance technicians. For buildings that don’t warrant a full-time engineer, our services are customized with engineers in fully-equipped trucks to perform building maintenance functions. Today’s building owners and managers are finding it more difficult to hire experienced and qualified building engineering personnel. Crockett Facilities Services can provide a solution by providing skilled and qualified building engineers for all service levels. We service the District of Columbia, Maryland and Virginia areas. Expertise – We are not just tour guides, picture takers, and filter changers. Our team is comprised of licensed and certified service technicians who have the expertise and tools to accurately inspect, diagnose, and service your equipment. Economical – We will work within your budget and timeframes to tailor our services to your unique needs. Reporting – We provide comprehensive reports, detailing our findings, readings, and recommendations. Emergencies – Our 24/7 mobile service team is on stand-by for emergency services. CMMS – Using a computerized maintenance management system (CMMS), we can maintain and track your service requests. Communication – You’ll be kept in the loop at all times, as our engineers are equipped with iPhones to alert you of their findings. Resources – When needed, we can call on our extensive network of established resources to solve unexpected or complex issues that may arise. We are the partner you can trust to reduce your building operating costs and maximize tenant comfort. Established in 2000, we provide on-site and mobile services to commercial and government customers. 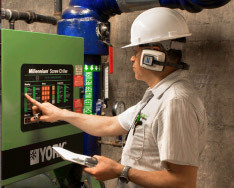 The additional services we provide include HVAC installation, preventative maintenance and repair, data center cooling, energy management, along with comprehensive integrated facilities services. Please call 301.262.2771 (ext. 1001) or email ddargenzio@crockett-facilities.com to learn more!